What Is DA Form 3685? DA Form 3685, JUMPS-JSS Pay Elections is a form used for establishing the pay account of the Master Military Pay File (MMPF). JUMPS and JSS stand for the Joint Uniform Military Pay System and the Joint Service Software. The latest version of the form - sometimes incorrectly referred to as the DD Form 3685 - was released by the Department of the Army (DA) in June 1983 and superseded the 1966 DD Form 1560. An up-to-date DA Form 3685 fillable version is available for digital filing and download below or can be found through the Army Publishing Directorate website. The form allows a service member to choose and specify the ways in which they would like to receive their military pay. The DA 3685 is approved for public release and unlimited distribution. Disclosure of the required information is voluntary, however failure to completely file the form will result in a delay of the requested actions. How To Fill Out Da Form 3685? Title 37 USC, Section 101. To provide the service member a means of electing the manner in which he or she desires to receive pay and allowances. To establish the pay account of the MMPF. requested information, the Finance Office cannot identify members, or take the requested action. a. If a held pay amount is also desired, check box and enter amount. a. SF 1199A attached. (Complete items (1) through (5)) . (Do not complete items (1) through (5)). I HEREBY AUTHORIZE PAYMENT AS SPECIFIED ABOVE. Item 1 of the form requires specifying the desirable frequency of payment, choosing between receiving pay either once or twice a month. The pay dates are usually scheduled for the first and fifteenth of every month unless the day falls on a weekend or a holiday. If this is the case, the payment will be issued on the last working day before the first or fifteenth. Item 2 is for electing a preferred method of payment. The two options are to receive payments through SurePay (direct deposit) or by receiving a check to a specified address. All soldiers must elect direct deposit to a financial organization upon starting active duty. Item 3 is for stating whether the applicant wants to elect a held pay amount. Item 4 is filed only if the Sure Pay option was chosen in Item 2. If the applicant has already filed and sent an SF Form 1199a to their financial institution, they only have to check the appropriate box. 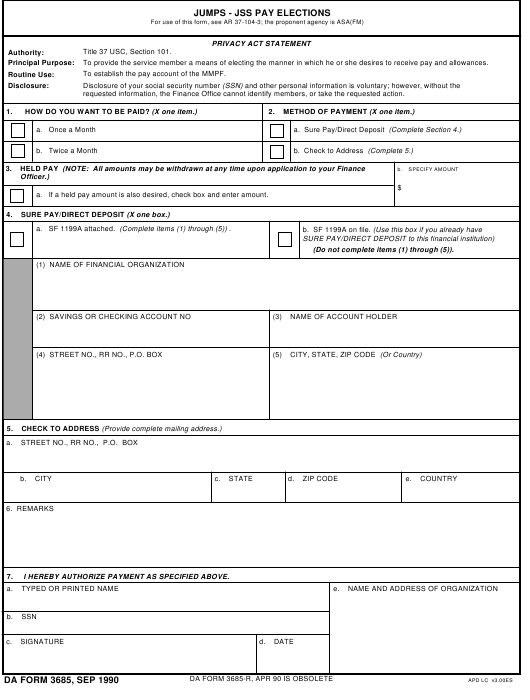 If not, the applicant has to fill and attach a completed SF Form 1199a and complete Boxes 1 through 5. They require the name of the financial organization, a number of the savings account or checking account, the name of the account holder and the full address of the organization. If the applicant has chosen the 'Check to Address' option, they have to file Item 5.Item 5 requires specifying the full mailing address in Boxes A through E.
Any additional remarks should be provided in Item 6. Item 7 is for authorization of the payment. This section requires a legibly written name of the applicant (either typed or printed), their SSN, name and address of organization, signature, and date of filing.